There’s a very obvious—make that obscenely obvious—difference between a cheap Deadpool costume and an expensive one. 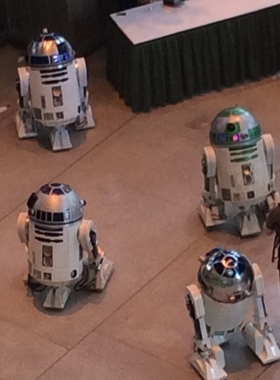 That was one of the takeaways from Emerald City Comicon 2016, which I attended on opening day (Thursday April 7) and day three (Saturday April 9). The runaway popularity of Fox’s Deadpool movie made the Merc with a Mouth one of the most popular costumes at the convention. But just a tip, guys: if your bodysuit is made of especially thin spandex, do us all a favor and wear a cup. Once again filling up The Washington State Convention Center, this year saw ECCC expand to four days for the first time since its 2003 inauguration. The expansion worked—all four days sold out completely. But Thursday was exceptionally light on celebrity guests. In fact, the Mainstage was not utilized at all. Opening day felt more like a dry run for the weekend. There were plenty of smaller panels to attend—one of the highlights being DC Entertainment: All Access, which focused primarily on the publisher’s much-hyped DC Rebirth, the upcoming relaunch of their core characters with books that will ship (in some cases) twice monthly and at a one-dollar-lower price point. My Chemical Romance frontman Gerard Way was on the panel as a surprise guest. Way introduced his DC imprint Young Animal, which will feature several mature-readers titles. By contrast, Marvel’s Next Big Thing panel (on Saturday) was a washout. “We don’t have any slides or videos,” one panelist announced at the start. “And no Axl Rose to announce our heavy metal comics line,” quipped another, apparently both references to DC’s far better-prepared, more fan-friendly, and all-around more fun panel. David Walker and Sanford Greene (writer and artist, respectively, of Power Man and Iron Fist) seemed bored to be there. Much of the panel focused on writer Kieron Gillen’s Darth Vader (one guest expressed her disappointment over Marvel’s abandonment of Dark Horse’s decades-long Star Wars expanded universe; the panelists understandably didn’t have much to say). The most awesome feature of ECCC 2016 was the Livestage, which live-streamed mini-panels throughout each of the four days (in partnership with Twitch). Most of these segments were 15 minutes, with minimal time in between, meaning there was always something interesting around the bend. Some of the Mainstage guests, like iZombie‘s David Anders and Rose McIver, had interviews on the Livestage (great for those not able to get a seat in the packed-to-the-gills Mainstage). Though seating was fairly limited, this area had a fairly high turnover rate in terms of viewers. For anyone fatigued by the insanely large hoards of attendees, this was a great place to grab a seat and chill out for awhile. Video game and animation voiceover star Nolan North was a Saturday highlight at the Livestage, as was the cast of PlayStation Network’s Powers TV series (lovely ladies Olesya Rulin, Logan Browning, Susan Heyward got the lion’s share of attention). As usual, ECCC 2016 was a lot of fun overall—bursting at the seams with events (anyone who didn’t pre-plan their day’s activities surely felt overwhelmed by the sheer volume of options, not to mention the sprawling layout that encompasses multiple levels and buildings). For the size of ECCC, the lack of truly big-name celebrity guests was distressing (especially when compared to last year’s blockbuster lineup; Nathan Fillion was the big headliner for ’16, I didn’t get to the Mainstage early enough to snag a seat for his panel). For the money and attention this convention garners, hopefully ReedPOP (if they continue producing the con) will book a more eye-catching rosters of celebs next time. 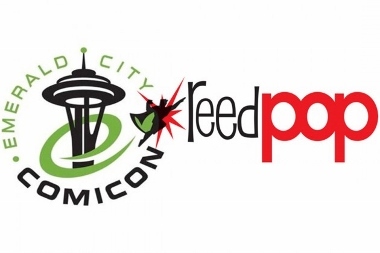 Emerald City Comicon 2017 is scheduled for March 2-5, 2017.